A robust research analysis has identified what factors can be targeted to support people to live as well as possible with dementia. The study, led by the University of Exeter and published in the journal Psychological Medicine, found that good relationships, social engagement, better everyday functioning, good physical and mental health, and high-quality care were all linked to better quality of life for people with dementia. 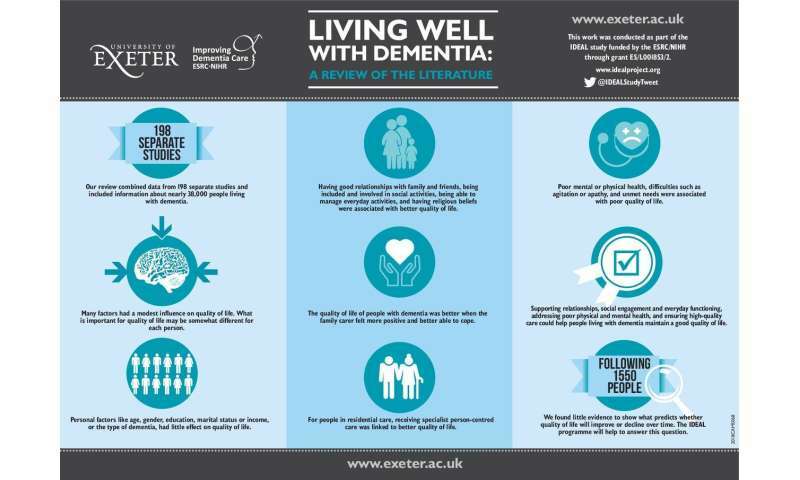 Professor Linda Clare, at the University of Exeter, said: "This research supports the identification of national priorities for supporting people to live as well as possible with dementia. While many investigations focus on prevention and better treatments, it's equally vital that we understand how we can optimise quality of life for the 50 million people worldwide who have dementia. We now need to develop ways to put these findings into action to make a difference to people's lives by supporting relationships, social engagement and everyday functioning, addressing poor physical and mental health, and ensuring high-quality care." The research was supported jointly by the Economic and Social Research Council (ESRC) and the National for Health Research (NIHR). It involved collaboration with the London School of Economics, the universities of Sussex, Bangor, Cardiff, Brunel and New South Wales in Australia, and Kings College London. The team carried out a systematic review and meta-analysis to examine all available evidence about the factors that are associated with quality of life for people with dementia. They included 198 studies, which incorporated data from more than 37,000 people. The study found that demographic factors such as gender, education marital status, income or age were not associated with quality of life in people with dementia. Neither was the type of dementia. Factors that are linked with poor quality of life include poor mental or physical health, difficulties such as agitation or apathy, and unmet needs. Factors that are linked with better QoL include having good relationships with family and friends, being included and involved in social activities, being able to manage everyday activities, and having religious beliefs. Many other factors showed small but statistically significant associations with quality of life. This suggests that the way in which people evaluate their quality of life is related to many aspects of their lives, each of which have a modest influence. It is likely that to some extent the aspects that are most important may be different for each person. Evidence from longitudinal studies about what predicts whether or not someone will experience a good quality of life at later stages was limited. The best indicator was the person's initial rating of quality of life. This again highlights the importance of optimising quality of life from the earliest stages of living with dementia. Dr Anthony Martyr, lead author on the study, from the University of Exeter, said: "While in general it is more of a challenge to maintain good quality of life as dementia progresses, we found little evidence to show what predicts whether quality of life will improve or decline over time. The IDEAL programme we are currently leading will follow people living with dementia over several years and will help to answer this question." Dr Doug Brown, Chief Policy and Research Officer at Alzheimer's Society, said: "Maintaining a healthy social life and doing things you enjoy is important for everyone's quality of life. As this Alzheimer's Society funded study highlights, people living with dementia are no exception. "Someone develops dementia every three minutes but too many are facing it alone and feel socially isolated- a factor that researchers pinpoint contributing to a lower quality of life. "People with dementia have a right to continue living a life they love. Alzheimer's Society's Dementia Friendly Communities initiative enables individuals, businesses and communities to involve and empower people affected - but we need all of society to unite to ensure people with dementia feel understood, valued and able to contribute to their community." The full paper, entitled 'Living well with dementia: a systematic review and correlational meta-analysis of factors associated with quality of life, well-being and life satisfaction in people with dementia', is published in Psychological Medicine. Authors are Anthony Martyr, Sharon M. Nelis, Catherine Quinn, Yu-Tzu Wu, Ruth A. Lamont, Catherine Henderson, Rachel Clarke, John V. Hindle, Jeanette M. Thom, Ian Rees Jones, Robin G. Morris, Jennifer M. Rusted, Christina R. Victor and Linda Clare. The study stems from the IDEAL programme. IDEAL is a major longitudinal cohort study of 1550 people with dementia and their family members or friends funded by the Economic and Social Research Council and the National Institute for Health Research. The IDEAL study is survey- and interview-based and aims to understand what makes it easier or more difficult for people to live well with dementia. The findings from the study will help to identify what can be done by individuals, communities, health and social care practitioners, care providers and policy-makers to improve the likelihood of living well with dementia. Since 2018 the project has been extended as an Alzheimer's Society Centre of Excellence, making it possible to follow the experiences of participants for several more years.